Our vacation is long over but before I get too far away, I wanted to post about my mom. I've mentioned before that she has had a very tough year after a few falls and a perplexing loss of abilities. All of her doctors (including a neurologist) thought maybe she'd had a mild stroke or that there was some geriatric condition they couldn't agree on, but even though I haven't lived near her for years, knowing her history, I couldn't accept their vague diagnoses. So I asked a good friend who is a neurologist for help. Gratefully, she got Mom in to see a colleague, a top-notch neurosurgeon at the BIG medical center in the city. Short history is this: for twenty years, Mom has suffered from NPH (normal pressure hydrocephalus), treated successfully with a surgically implanted shunt that corrects the flow of excess fluid on her brain. The symptoms of the condition sort of mimic Alzheimers and Parkinsons so it's tricky to diagnose and treat, especially when the shunt acts up. Her current shunt is a magnetic one which means it can be programmed with a non-invasive adjustment in the doctor's office. After opening or closing the microscopic valve more or less (with a wand like the ones they use for an ultrasound), the rate of fluid flow changes and so do the symptoms. Happy ending to months of evaluations and dead ends: once we got the right doctor (with the patience and creative thinking) who adjusted the shunt the right way, it was an almost overnight recovery. Walking, memory, cognition, coordination. She went from reading the same few pages in her book over and over for 6 months to finishing a book start to finish in 3 days. And the jokes and funny stories came back too. Her mobility is improved but her balance is still shaky (we watch her like a band of annoying nurses). She's 80 and all this has taken a toll in other ways. Still, at her age, this was really miraculous. Her physical therapist was stunned to see the changes in the space of a week. So, 6 months ago I would never have suggested we all go out to Fire Island together. In an emergency, the only way off the island is by helicopter. But given her great recovery, we all decided to go for it. As she would say, "Why the hell not?" In every way imaginable, it was a very good idea. Spending a week in a small beach cottage with her grand-daughters and the rest of us was pretty much all she needed. She read, played dominoes, told stories, laughed and made us laugh, got gussied up for dinners out and yes, even made it down to the beach. With the help of her entourage, we leapfrogged a big deck chair ahead and walked her in small distances to sit and rest. It worked just fine- there's no hurrying at the beach. She sat by the shore with us, watched the babies play in the sand, chatted with her adored girls about their books, bikinis and boyfriends. She felt like her old self. We're all hoping for a much brighter year ahead for her. She's back! Let's get this party started! Finally, a break in the heatwave here! Yesterday I joined Maggie on her volunteer day at the CSA. Early in the morning, under a shady tree in Sleepy Hollow, we tended and refilled the bins of vegetables and fruit for the pick-up. Corn, baby eggplant, cucumbers, kirbys, carrots, yellow cherry tomatoes, tomatoes, kale, blueberries and apricots. So sorry I forgot to take my camera, but it was really fun being on that side of the produce table and helping everyone collect their shares. Inspired to start earlier in the day and get more done, I just cleaned up the studio some and uncovered a few half-made things that have lost their way in the mess. Like summer meals, the simplest projects are welcome these days. A basket with just a few elements and tools seems to have the most promise. Matthew Mead was kind enough to ask me for a little project for his upcoming holiday magazine. I so enjoyed that collaboration and it has me excited to see what the magazine's going to look like. (You can pre-order a copy of the magazine here.) Won't be long now- suddenly October seems right around the corner. Sorting my archives today. 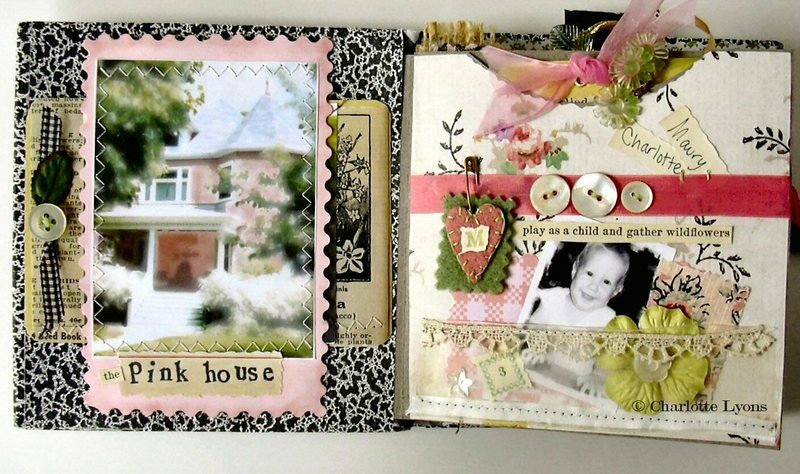 Apparently, I still love pink houses! Summer has something to say this year, doesn't it? Okay already, got the message. We took our walk last night around 9 pm and it was still so hot. 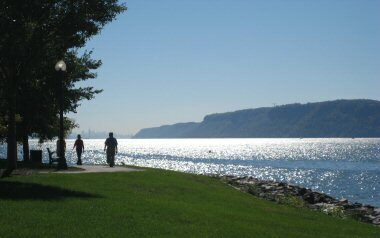 Lots of people there at the park on the Hudson- playing softball, basketball, jogging with babies in strollers, sitting on park benches visiting like it was 3 in the afternoon. It was actually pretty exciting to see that because during the day, the town is completely shut up indoors. Did you know that before air conditioning, people used to sleep in Central Park on nights like these? Staying in front of the studio fan here, cutting out little birds, getting kits ready to go out and eating lots of peaches, cucumbers and cherry tomatoes. The farmer's market is tonight in town. Hoping the summer storms hold off and we all get a chance to stock up for another week of no-cook meals. For those of you battling the daily heat- especially with children, go visit Maya and Annekata's summer circus. Love all their home-made ideas for cooling off. Such clever girls, such sweet ideas! Home again. We had a wonderful vacation together and I'm so glad you enjoyed the postcards. Feels good to be back. I did a lot of stitching, sketching and thinking at the beach. Keeping myself busy under the umbrella with projects, reading the paper every day, the BP tragedy and the NY Times' extensive coverage, the mostly untouched beach way up here. Thinking about the sea creatures suffering so terribly- in the Gulf and elsewhere. And I missed working on Rebecca's fabulous sampler. All that combined into this little guy one day (and a few other designs too). Stitching his turtle shell full of different colors and patterns was so much fun. This stitch here, that stitch there. Changing colors. Imagining. Now that I'm home, I got back to my studio and put it all together- pattern, stitch guides, photos and instructions- to share with you. I will be posting the design as a 3 page PDF in my Etsy shop today. 50% of the proceeds will go to the Sea Turtle Conservancy, an organization working very hard right now to save the turtles in distress. 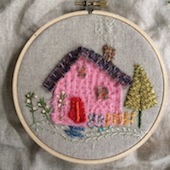 Kind of a nice way to help out and enjoy embroidering creatively. Perfect vacation or car project. Set the kids up with their own hoops, pass the threads around and stitch a family of turtles! Whenever we went on car trips as a family, after all the fits and starts, my mom would happily announce, "And we're off! Like a herd of turtles!" If only it were this easy to make real turtles.